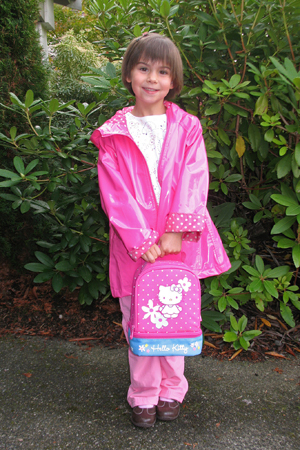 My first day of kindergarten was on Tuesday, September 8th. (School actually started August 31st, but I was in Holland with Papa, and I missed four days.) I was very excited to begin my year as a "senior" in the class [left]. When I got to class, Miss Jody was glad to see me. I gave her a big hug. Then I knew just what to do, because I've been in the same classroom, with the same teachers, for two years already. I hung up my coat, put my Hello Kitty! lunchbox in my tub, and changed my shoes to my new classroom slippers. Then I went to greet my classmates. Some of them returned from last year, like Emery and Luna. But there were new kids, too. We did all the usual things for the day: circle time, morning snack, lunch, and recess. We also learned about planets. I'm really excited to be a kindergartner. Later in the year I will get a checklist for my daily work. I've already promised Mommy that I'm going to get all my work done. This is going to be a great year! The weekend before Halloween, Mommy, Papa, and I visited the South 47 Farm. First, we trekked through lots of mud to look at all the different pumpkins. (We didn't need to buy one because we grew our own in our compost bin!) I especially liked the giant pumpkin someone left sitting in a wheelbarrow [right]. Then we tested our navigation skills in the corn maze. The corn this year was dry and dead, not green like in past years. That made the maze more difficult because it was harder to tell the real paths from the informal paths that visitors had pushed through the corn, and we had some trouble finding our way. But after we'd found nine of the ten hidden riddles, Papa miraculously doubled back and found the last riddle station, and we completed our punch cards. We each chose a little white pumpkin to take home as a reward for our hard work. Just as we got back to the car, rain started to fall. Perfect timing for a fun day! 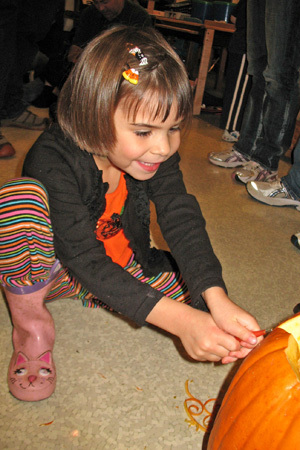 About a week before Halloween, my Montessori class hosted a family pumpkin carving night. 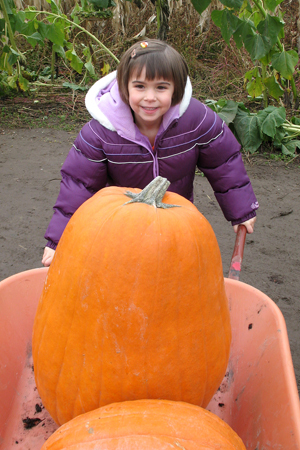 We brought the big pumpkin that grew out of our compost bin. I told Mommy what kind of face to draw, and she and Papa carved out the pieces. Then I peeled some "hair" [left]. When everyone was done carving, we took our pumpkins out into the rainy night, lit them, and took photos. I ran around the flagpole in the rain. I was quite wet—but very happy. Later in the week my class had a Halloween party. Mommy took off work and came to help! Each child got to decorate a sugar cookie with neon orange frosting and lots of Halloween sprinkles, and Mommy supervised us two at a time. I behaved very well and did my work until it was my turn to decorate, but it was challenging not to jump around because I was very excited that Mommy was there! This year I got to go trick-or-treating twice! First, I went trick-or-treating at Madison House Friday morning. 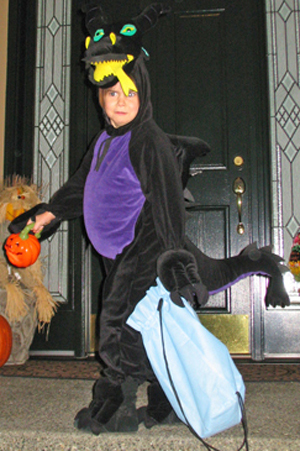 I wore my Maleficent costume, the Evil Fairy Dragon from Sleeping Beauty. (We found it at Value Village early in the month.) We went door to door on all four floors of the retirement home, and all the grandmas and grandpas were glad to see me. They gave me lots of candy. 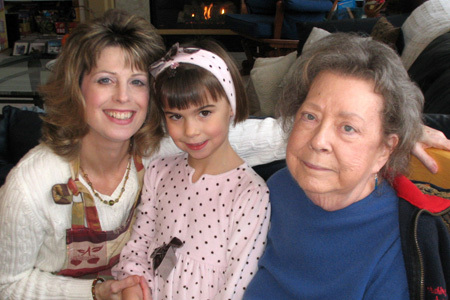 Later that afternoon we went back to Madison House for Happy Hour with Grandma. I wore my Maleficent costume, and Mommy wore her angel costume, too. We ate snacks, and there was a costume contest. I wanted to be in the contest, but Mommy explained that it was only for people who lived there. I next trick-or-treated on Saturday night, Halloween. We had an early dinner, and then I changed into my costume again [right]. It wasn't raining, so I wore long underwear underneath it and didn't have to wear a coat. Mommy, Papa, and I walked around the neighborhood, and about half the houses had lights on and opened their doors. I was very good about saying, "Trick or treat!" and "Happy Halloween!" Even with some houses dark, I still got a very big bag of candy! When I got home, I dumped all the goodies out on the kitchen table and offered to share with Mommy and Papa. I had two pieces and they each had one, and then I got ready for bed. I brushed my teeth really well after all that sugar! Finally, on Monday, November 16th, I pulled it out [left]! I was sick the next day, so I couldn't show it to my friends, but Papa put it in a little plastic bag and on Wednesday I took it to school. That night I placed the tooth in the care of my tooth fairy doll. 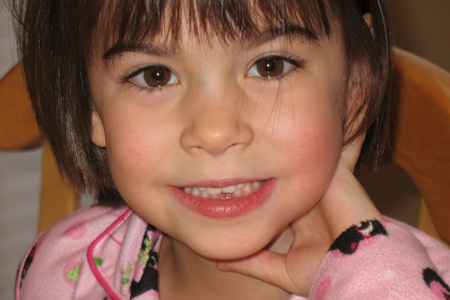 She carries a little bag to keep the tooth safe for the real Fairy. Then I made a big sign that said, "Sofia's tooth" with an arrow so that the Fairy would be sure to find it. The next morning, my tooth was gone and I found $3 under my pillow! I put all three dollars into the Share section (rather than Spend or Save) of my money bank. 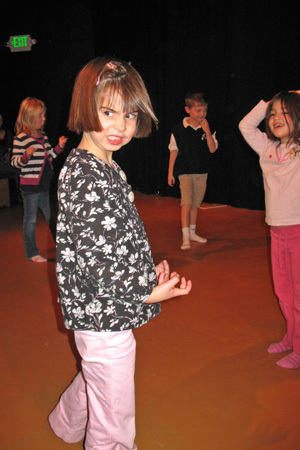 On November 18th my very first drama class gave an end-of-session performance for parents. Mommy and Papa came and sat in the front row to watch me. While my teacher, Miss Mandy, read short pieces, my new friends and I acted them out. One of the four was "Five Little Monkeys Jumping on the Bed," for which I was a dog scaring the monkeys. My personal favorite was Maurice Sendak's Where the Wild Things Are, in which I played a sail on Max's boat, as well as a wild monster [right]. Mommy and Papa were very proud of me, and after the "show" we went to Shari's for dinner to celebrate. I had my favorite meal, a "happy pancake." This Thanksgiving was a special day. We celebrated on Friday, instead of Thursday, so that Cameron, Grandpa and Bonnie could be there. I helped a lot with the preparations. The day before, I made the pumpkin bread with Mommy's help (I even cracked the eggs! ), and I also helped with the pumpkin pie (I stirred the ingredients). Cameron made our special cranberry salad Friday morning, and Mommy prepared broccoli, mashed potatoes, brown rice, and turkey roulade for dinner. I played most of the day. Mommy went to get Grandma from Cascade Vista, where she was staying to do physical therapy, about mid-day. Grandpa, Bonnie, and Bonnie's sister Jackie and her husband, David, arrived a little later. We had to put an extra table in the family room to fit everyone (Cameron and I sat at the "kids'" table), and we all gathered together and had a very nice meal. Mommy said she was thankful that all her family could be there. I was, too.